- Ideal for Christmas party, Halloween, night clubs, glow bar, gallery, theater, birthday party and stage Lighting. 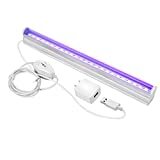 - Durable UV lights flood light, aluminum alloy shell, lightweight and easy to install, and the best heat dispersing capability. 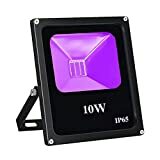 - Ultraviolet bright 10W UV LED black light fixture easily covers a large living room, garage or outdoor party. - UV flood light create stunning atmospheres at Blacklight Run and parties, works great with UV body paint and fluorescents.